Diving is born from the need of the human being and his instinct for survival, always trying to reach greater depths and stay in them for longer. In the beginning, diving is practiced with the objective of obtaining natural resources. 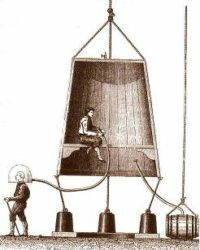 Subsequently other motivations such as the recovery of goods from wrecks are generating an interest and with it new ideas for their practice that will revolutionize the world of diving, such as the first diving bell in 1535 or the first diving suit in the year 1839. It can be said then that the beginnings of diving are largely related to commercial diving. Commercial diving is considered a profession of risk and the training required for their practice, as well as the equipment used are very different to everything related to scuba diving. Inshore diving includes all underwater activities that are practiced at distances from the coast of up to 12 miles, such as work in ports, fish farms, nuclear power plants or swamps. Offshore diving, on the other hand, is anything that takes place at distances greater than 12 miles, such as that practiced in well-known oil platforms or special cases of diving for scientific purposes. Although it is not diving itself, in many countries any work carried out outside the water in hyperbaric environments also requires a professional diving certification, as is the case of tunnel boring machines. It is also convenient to consider the possibility of hiring a commercial diving insurance. Although we are already covered by the insurance of the company, it is something to take into account due to the daily risk to which we are subjected in professional diving.